NAGOYA - Harumafuji became the first of sumo’s top rank to taste defeat when he was sent crashing by rank-and-filer Yoshikaze on the fourth day of the Nagoya Grand Sumo Tournament on Wednesday. 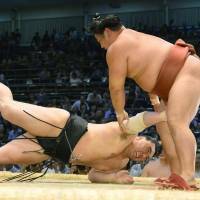 Sumo’s two other yokozuna were in razor-sharp form as they shredded their respective opponents. Hakuho, who is seeking his career 30th championship, Kakuryu and demotion-threatened ozeki Kotoshogiku feature among a group of five wrestlers in the early lead at 4-0. Ozeki Kisenosato sits one off the pace in a logjam of nine at 3-1. Yoshikaze (3-1) got the better of Harumafuji for the second consecutive tournament after beating the yokozuna on the first day of the summer basho in May at sumo’s fourth-highest rank of komusubi. But this time it was the No. 2 maegashira’s first kinboshi win (maegashira win over a yokozuna). Harumafuji was sent off-balance at the start when Yoshikaze darted to his left, and he never really recovered before being brought down with a swinging shoulder throw. But Hakuho was in sheer destruction mode against Homasho (1-3) when he muscled the No. 2 maegashira toward the edge before jettisoning him into the ringside seats. After the match, the yokozuna, who is aiming to become only the third man in history to win 30 titles, stared down his opponent from the raised ring. Kakuryu, in his second tournament at the top rank after a pedestrian 9-6 showing in May, manhandled winless Shohozan, bouncing his opponent around like a pinball before deploying a smack-down technique for the final blow. 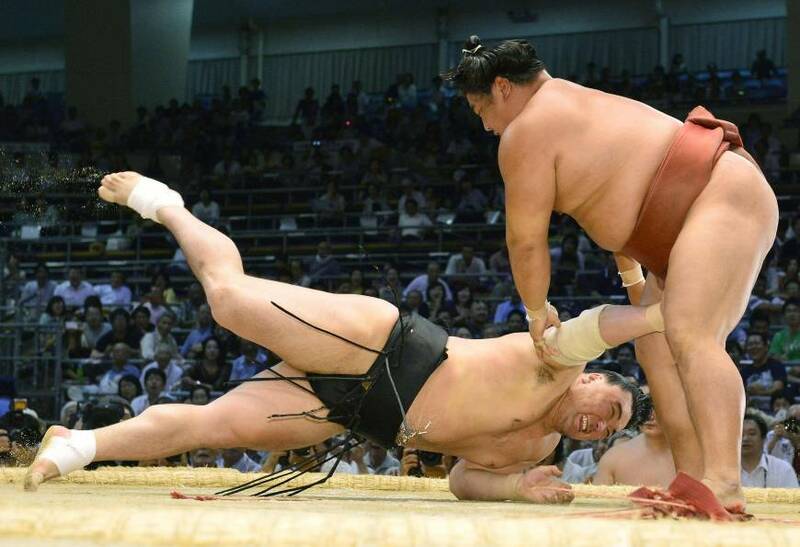 Kisenosato rolled over Ikioi, stopping the winless top maegashira dead in his tracks with an impregnable defense before crouching low and catapulting his opponent over the edge to stay one off the pace. Kotoshogiku made it 2-for-2 for sumo’s second-highest rank, sending Kaisei sprawling to a fourth defeat with a left-handed overarm throw. The ozeki is now just four wins away from escaping relegation. Goeido (3-1) appeared to be on the ropes against winless Aoiyama as his Bulgarian komusubi opponent charged him to the straw bales, but the sekiwake turned the tables with a last-ditch overarm throw with his back to the edge to escape with a narrow win. Egyptian-born Osunaarashi (2-2) unleashed a fierce forearm to the head of Chiyootori (1-3) at the face-off, causing his opponent to immediately crumble to the dohyo surface. Osunaarashi, the first wrestler to hail from the African continent, will make his first challenge against sumo’s top rank when he faces Kakuryu on Thursday. Endo was tripped up by Takekaze (3-1) right out of the gate when his smaller opponent came out of the crouch low and knocked the popular No. 5 maegashira off-balance before smashing him to the dirt surface for a third defeat.